This tip will show you how to create text (or other shapes) that looks like its made up of graphics. 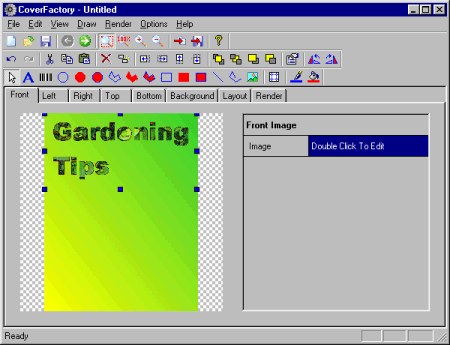 In my example, I will make the phrase "Gardening Tips" look like it is made of plant-leaves, and then place it on an eBook cover that I am making using CoverFactory. 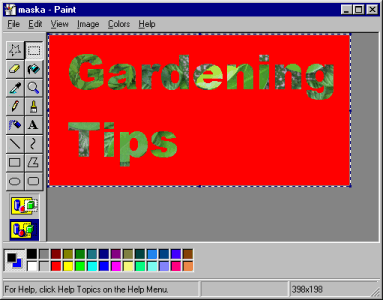 I will explain how to do this tip using the Paint accessory that ships with Windows (you'll find it on your Start menu most likely under Programs/Accessories), but you can do the same trick using other paint programs too (although exact details of menu options etc., may differ). 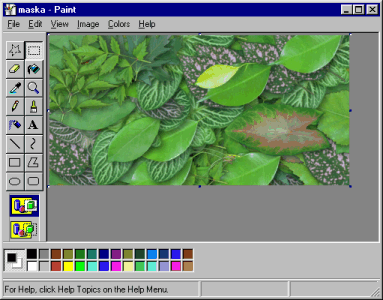 Here I have loaded an image that shows a scattered array of plant-leaves. In Paint, the easiest way to do this is to click Attributes... on the Image menu (or just press Ctrl+E for a keyboard shortcut to the same thing). Make a note of the values. 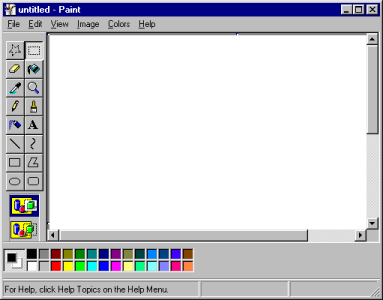 The new copy of Paint starts off with a blank image. Make sure the blank image is the correct size. 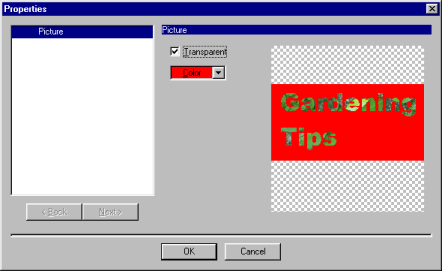 When the new copy of Paint starts, the blank image may not be the correct size, so use Attributes... on the Image menu to size it to the exact same size that you noted down in step 2. Next draw the mask that you want to use. You should draw in only 2 colors (like a silhouette of the final shape that you are masking to), and use colors which don't occur in the original image. For my example, as my plant-leaves are various shades of green (plus perhaps a little black, white, browns and grays), I decided to use red and blue to draw my mask. 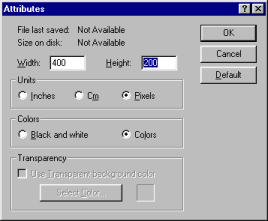 When you are finished to drawing, click Select All, then click Copy (both options are on the Edit menu). 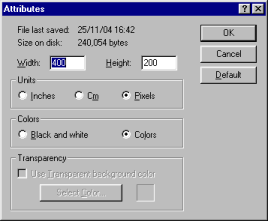 Set the Paste mode to Transparent. Set the background color to the silhouette color. 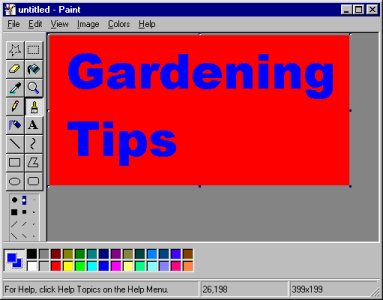 In Paint, you can do this by right-clicking on a color rectangle in the palette at the bottom of the screen. Paint will stay in the special pasting mode (allowing you to move the mask around) until you select another drawing tool - so it's a good idea to click one of the drawing options (for example, the Rectangle) in the the Tool Box on the left). Your mask is now ready to use. You might want to save a copy (using Save As... on the File menu) for safekeeping. When you're ready to proceed to the next step, click Select All, then click Copy (both options are on the Edit menu). 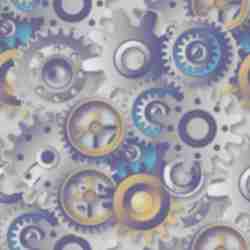 Start CoverFactory and go to the side of the image where you want to paste your masked image. 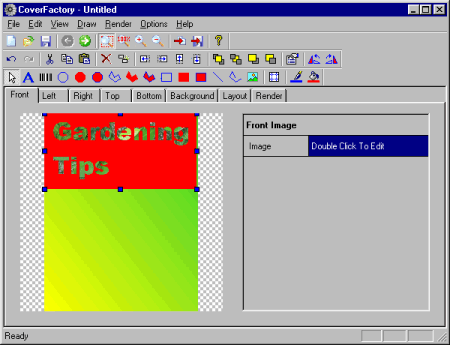 Click Paste on the Edit menu to paste in the mask image. If the mask image is not in the right place, you can use the mouse to drag it around (if possible try to avoid resizing the mask, and you'll get better results in the final rendered version of your cover). When your mask image is in the right place, click Properties... on the Edit menu. 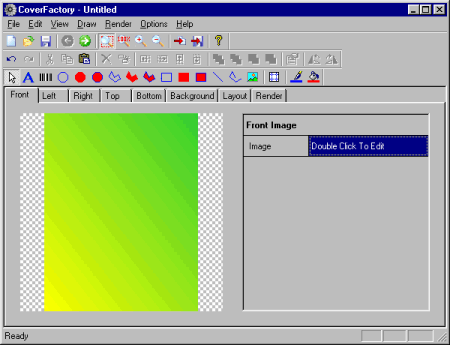 Using the dialog box, set the image to Transparent, and select the mask color as the transparent color. You're done, and now ready to proceed with drawing whatever else you need on the cover, and eventually rendering it (using the normal CoverFactory procedures). In my example, I now have the fancy text made of plant-leaves on the front of my eBook cover... but perhaps I ought to reconsider my choice of background for the front?